*Google appears to be planning some major features for the upcoming version of Chrome. Code changes earlier this week had hinted at a Dark Mode being developed for macOS. Now, another new feature has been spotted that would group tabs together in sets. It remains unclear how exactly will this grouping feature work since it can’t be just “click on a group of tabs to open them all in a new window” as that can already be done. 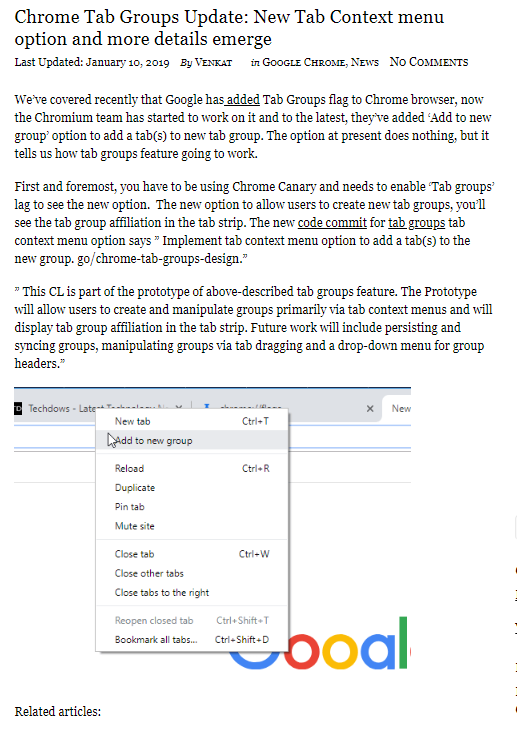 The above description (via TD) also talks about using context menus for manipulation, so it will be interesting to see how it’s going to be designed in a way that improves productivity, removes clutter, and doesn’t require too many clicks. The feature is in early development, but, if approved, it would be available for all versions of Chrome, including Windows, macOS, Linux, and ChromeOS.